Henshaw, Robert F., head-of-household, age 24, born in Oklahoma; father born in Indiana; mother born in Texas; first married at age 23; rented home; no radio in home; occupation: farmer, general farming; not a veteran. Henshaw, Flossie E., wife, age 18, born in Oklahoma; parents born in Arkansas; first married at age 17. Henshaw, [..no first name recorded..], head-of-household, age 34, born in Oklahoma; completed 3rd grade; on Apr 1 1935 was living in the same place/area; rented farm; occupation: laborer, farm; worked 36 weeks in 1939; $216 wages in 1939. Henshaw, Flossie, wife, age 27, born in Oklahoma; completed 5th grade; on Apr 1 1935 was living in the same place/area. 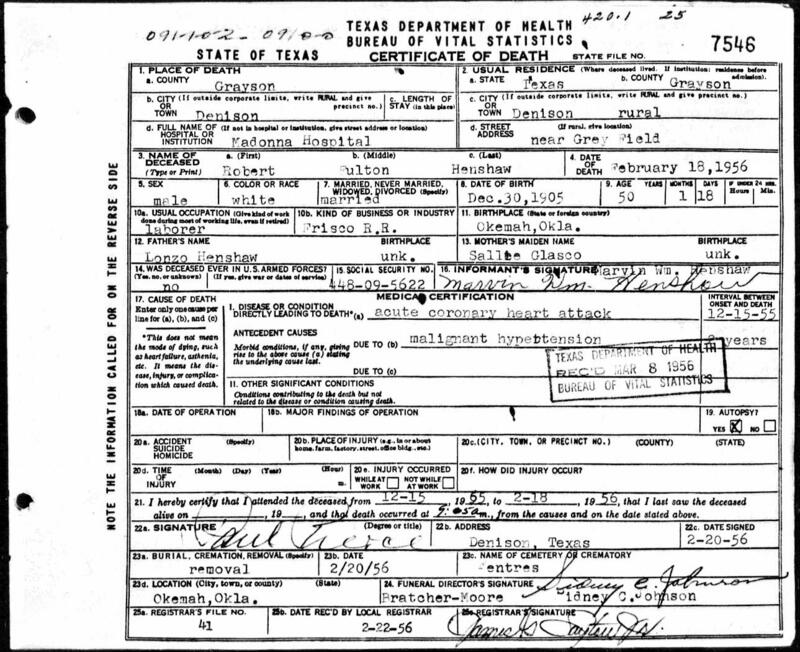 Henshaw, Marvin, son, age 7, born in Oklahoma; on Apr 1 1935 was living in the same place/area. Henshaw, Raymond, son, age 2, born in Oklahoma. Contribution from Jo (Henshaw) Shelton. 1940 census, Weleetka Township, Okfuskee County, Oklahoma; roll T627-3316, ED 54-31, page 9A, line #13, household #151. Contribution from Shelia deCordova (). Obituary of Ashley Nicole Sanders. The Church Of Jesus Christ of the Latter Day Saints (LDS) International Genealogical Index (IGI) - Oklahoma. 1910 census, Bearden Township, Okfuskee County, Oklahoma; roll T624-1265, ED 135, page 94A, line #29, dwelling #154, family #154. 1930 census, Hickory Ridge Township, Okfuskee County, Oklahoma; roll T626-1917, ED 8, page 5B, line #82, dwelling #90, family #92. 1930 census, Hickory Ridge Township, Okfuskee County, Oklahoma; roll T626-1917, ED 8, page 5B, line #74, dwelling #89, family #91. 1930 census, Hickory Ridge Township, Okfuskee County, Oklahoma; roll T626-1917, ED 8, page 5B, line #84, dwelling #91, family #93.